The local organic strawberries are flowing and I just love buying flats of these jewels to create new recipes. Pectin, Flax, Chia: All of these contain fibre that helps to gel the juicy fruit together. Add in some raw honey at the very end (so you preserve the antibiotic quality of the honey) and you have a magic combo that tastes amazing on everything from coconut yogurt to cashew ‘cheesecakes’. Flax is the #1 whole-food source of lignans, a cancer fighting phytonutrient! Because lignans are activated by our gut bacteria, taking antibiotics may impair the function of the lignans so be sure to boost probiotics with your flax seeds for full results. Flax seeds are an excellent source of Omega-3 fatty acids, iron, zinc, copper, calcium, protein, potassium, magnesium, folate, soluble fiber and even boron! 1. Rinse the berries and rhubarb. 2. Chop into 1 inch pieces. 3. Bring fruit and water to a boil on the stove and then reduce the total time of 25 minutes. After it’s cooled on the stove, add honey and flaxseed. 4. 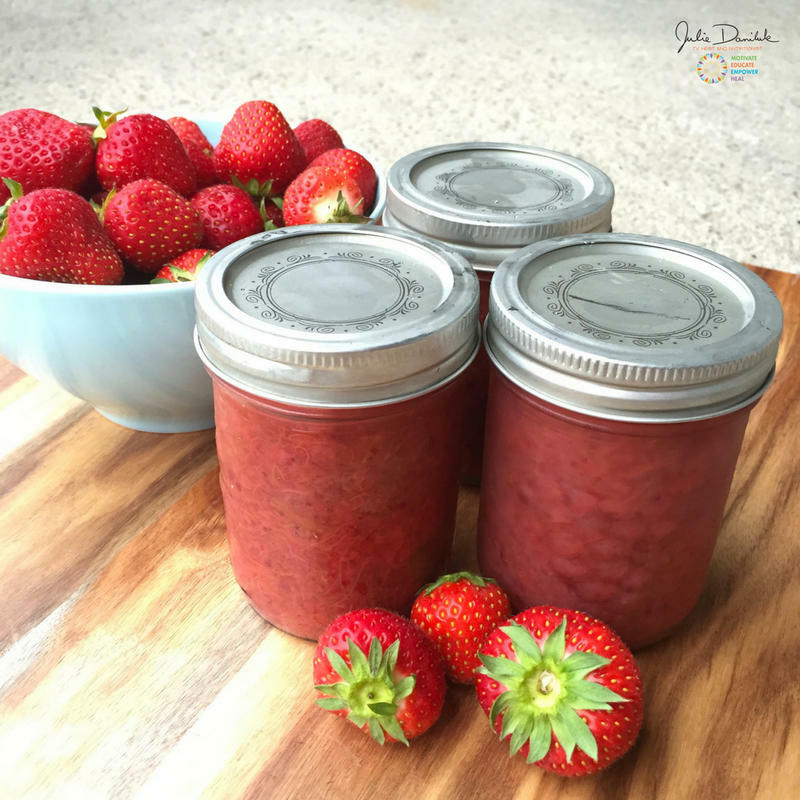 Mix well and add to small, jam size mason jars while still warm. This recipe will store in the fridge for 2 weeks. It can be frozen.